Little Five lost his television and Wii privileges this week, and so there have been long afternoons when he has NOTHING to do and NO ONE to play with. Oh, and EVERYONE IS SO MEAN. On the plus side, he has spent some quality time with his matchbox cars and his Tag reader, and I haven’t listened to the Caillou theme song in four whole days. So it’s been a tricky week for getting anything done. I suppose I should be embarrassed to admit that I can’t get anything done when my kid isn’t entertained by a screen of some kind, but there it is. Just Dance 4 has been my babysitter lately. He’s getting exercise, and I can attack a project or write an entire paragraph without interruption. Did I accomplish anything this week, beyond emptying the dishwasher and folding clothes? I cleaned out the computer armoire, which is Step 1 toward the goal of replacing it with a simple desk. Step 2 is to measure and cut down one of our old closet doors into a desk top, then a trip to Ikea for some table legs (that’s on the calendar for next week). Just writing this post motivated me to find a home for the things I removed from the armoire (one bag of computer games to Freecycle, several reams of paper, a box of CDs and cords, and a stack of old photos). Except for the photos, the contents of an entire cubby went straight into the recycling. 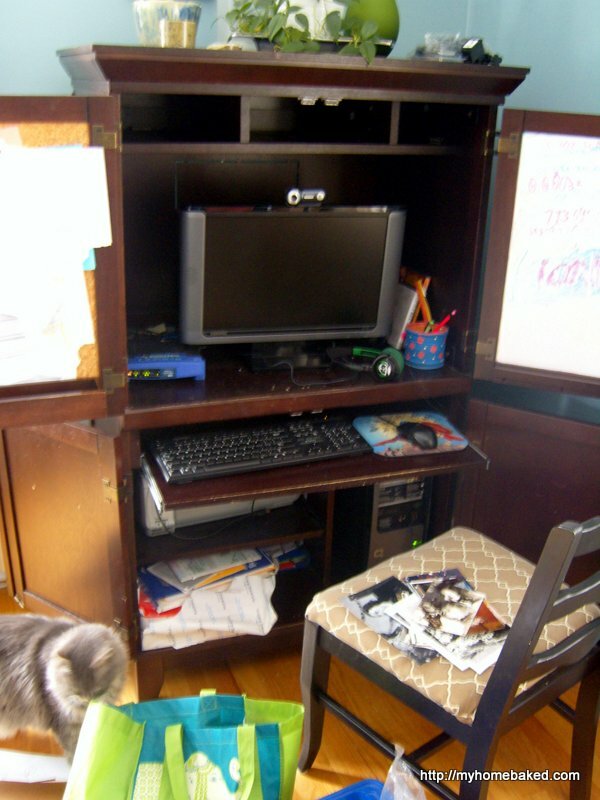 This is why I want a desk without storage–fewer places for junk to hide. This is the computer the kids use, and the only desk accessory they really need is a waste basket. I envision an uncluttered desk with only a small tray containing a pencil cup, note pad, and a little box to store a few flash drives. We might keep a small memo board to post frequently used usernames and passwords, and maybe some hooks to hang their headphones. With an open desk, I’m going to have to wrangle some cords and decide how to disguise the modem and router, but I’m not there yet. Baby steps, no?